What exactly is thought leadership and how do you become a leader? In business, many individuals and organisations aspire to be thought leaders. 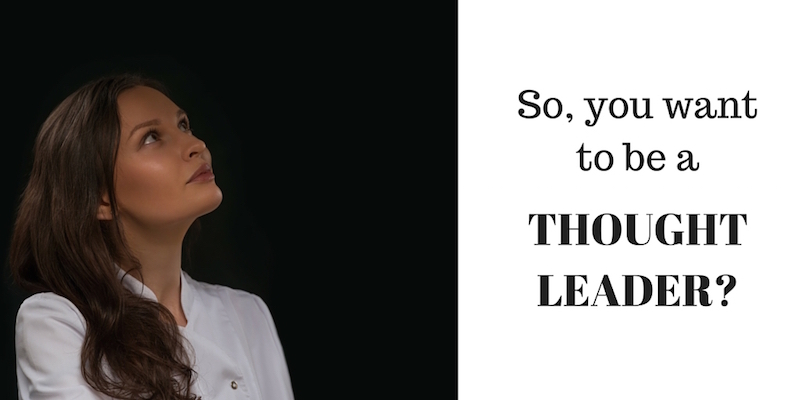 But what exactly is thought leadership and how do you become a thought leader? Prince and Rogers highlight the importance of being both recognised and rewarded for your thought leadership activities. If increasing fee income on the back of their reputation is what motivates individuals and firms to engage in thought leadership activities, researching, writing, producing and distributing content across a variety of platforms is the outcome. But to get a return on your investment in content, you need to think about quality. In particular, you must focus on what unique insights you can share that will make your clients value your work over your competitor’s. In other words, what differentiates you from your peers? The Forbes article cites the example of a tax firm and shows how it must go beyond merely reproducing or summarising a new piece of tax legislation in order to be regarded as a thought leader. That’s not to say that summarising a piece of legislation and alerting your clients to the key points is not a useful exercise. It is useful and many clients value it. But, to be a thought leader requires more: insight and visibility are essential. We’ll look at these in more detail in a moment, but first let’s explore a few further definitions of thought leadership. Our thought leaders bring a powerful combination of experience,technical expertise, passion and personability to every project – which means our clients receive advice that comes from the heart and mind. They offer deep, reflective thinking on the issues and challenges that clients face right now, not mere opinions on the latest trends. BDO and Influence at Work were engaged by NHS Bedfordshire to use social influence techniques to reduce DNAs across two GP surgeries. Passion, personality, influence and “not mere opinions on the latest trends” may or may not form part of your preferred definition of thought leadership but the chances are that the profit motive — that second part of the Prince and Rogers definition — is one that you will share with your peers. Put simply, raising your profile helps attract business and can support charging higher fees. So the question, if your firm’s not already producing thought leadership content, should you start and/or how do you go about it? Since you’ve read this far, I’ll assume you are interested in starting so from here on, I’ll focus on the ‘how’. Let’s begin by returning, for a moment, to those elements I mentioned earlier — insight and visibility. Typically, professional firms — particularly firms with international affliliation — use the resources of their network to add global insights to local knowledge. This allows them to improve the quality and value of their presentations and written communications. The complication with thought leadership initiatives is that they are increasingly becoming undifferentiated commodities. This is a function of poor conceptualization and poor implementation. For example, many accounting firms are producing multitudes of reports. The problem is that most of these are unimaginative rehashes and “me-too” documents. And poor quality content can be detrimental to your firm. So, how do the best thought leadership firms go about it? In 2014, Source for Consulting named IBM the top provider of thought leadership materials. IBM’s content leads all firms in both ‘Resilience of content to instill confidence in materials’ and ‘Prompting action from the reader’. By conducting global research through in-depth — and often face-to-face — interviews we’re able to understand industry transformation and provide counsel to improve business performance. Conducting research is an exercise that most professional services firms undertake and is the starting point for many thought leadership activities. Then, through their networks and international affiliations, many firms have access to global knowledge and resources which they can draw on add insights to their local research. Once you have your thought leadership content, the next step is visibility. Without the ability to communicate and distribute your content, the return on your research and insights may be lost. Practical communication activities that you can adopt include contributing articles to your industry publications, authoring reports and case studies, blogging, commenting on local and national radio and TV, speaking at conferences and participating in relevant organisations and forums — online and offline. Just remember your distinctive knowledge and expertise are what make you a thought leader. Focus on quality and on the unique insights you alone can deliver to your audience.